OLD PARKED CARS. 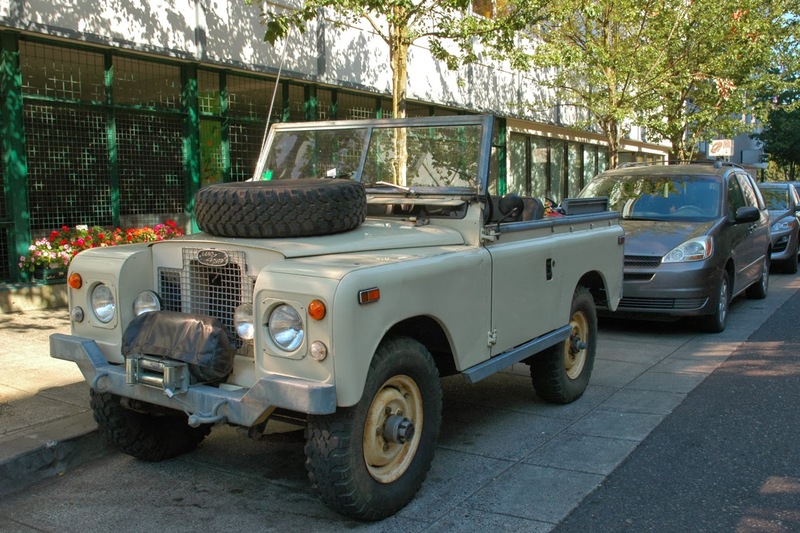 : 1969 Land Rover Series IIA 88 Convertible. 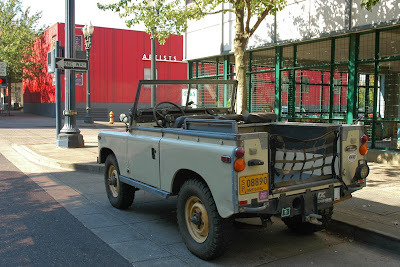 1969 Land Rover Series IIA 88 Convertible. I like the mushrooms growing on the floor. Maybe it would be a good idea to put the top on when parking for the night. such a great looking off roader. I love the seating arrangement in these, 2 or 3 across in the front and 4 parallel in the back. it's gotta be fun riding around in that thing. what a great rig. so great to see it utterly bare-bones primitive stock. and yes--thank you for documentation of the five levers on the floor. What are all those levers? From left, I recognize hand brake & shift lever. Black/red/yellow knobbed sticks - some combo of 2WD/4WD, Hi/Lo range selection, PTO? I'm sure there's a manual choke somewhere on that dash, too. longest lever is gear shift, yellow is instant 4wd hi, can be used while moving. red is 2wd hi return and 4wd lo. pull red towards you and push back to center position for 2wd high, yellow should pop back up and 4wd lo is achieved by pulling red towards you. going out of 4wd lo push red away from you. red is only used while stationary. 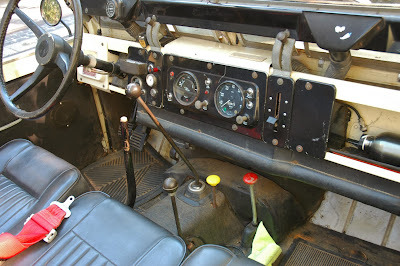 and lever with white button is e-brake. I love him.....and don't anyone try to give me the old "vehicles are female" line because there is no way this truck is a girl... not with all of those shafts and hard edges. I am though...a girl. You know, just think about this. Given the way things are done nowadays, with so much emphasis on style over substance, a vehicle like this which is nothing but *pure substance* stands out as an icon of value. 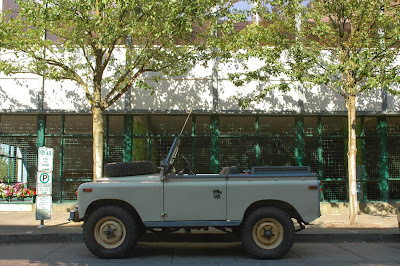 If Land Rover were to try to produce this vehicle today it would probably end up looking like a cartoon of this car. I like to think of it like "this was produced by Land Rover before they went commercial". Due to its pure utility it makes me think that its economic value is almost unmeasurable - regardless of what "The Market" says it is worth. It is so far outside the realm of today's over-styled, curried, focus-grouped, demographically targeted approach to doing business. And, just oh-by-the-way, it seems to me that OPC has just really been on a roll lately. The stuff you guys are posting up is just incredible. I'm loving it. The forest of levers is pretty cool but the ash tray between your knees is engineering genious. i would love to use that ash tray while driving this thing around on a sunny day with the top down. Get out and lock the hubs. That's as utilitarian as it gets.